The first thing you notice about the new Swift is that it does not look very different from the old one. Prices are expected to be Rs 15,000 to Rs 30,000 higher than the existing variants, which would make the anti-lock braking and the dual front airbag-equipped ZXi model cost around Rs 560,000 to Rs 570,000. The first thing you notice about the new Swift is that it does not look very different from the old one. This is not like the facelift Maruti gave its classic Zen. 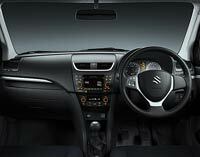 The designers wanted to keep the 'feel' of the old Swift, says Maruti. The headlights and taillights are, however, much bigger and bolder than in the earlier version. One feature that catches the eye, at least on the topspecified petrol ZXi and the new diesel ZDi variant, is the smart new alloy wheels. The new Swift rides a new platform that has a longer wheelbase and is a bit wider - though still narrower than the Hyundai i20 - improving seating comfort and providing more legroom for passengers in the rear seat. The rear suspension has been changed, which makes for an improved ride and much better handling on sharp turns. Lastly, the petrol engine has been given variable valve timing, which provides it a slightly improved throttle response and a moderate four per cent improvement in fuel economy, claims Maruti. There are also changes inside. The added length and width are perceptible; even though the car has just a 50-mm extended wheelbase, rear-seat legroom feels much better. But the big change is in the design of the central console and the instrument cluster, which seems to have been inspired by some competing products. The instrument cluster will now have an information display - a standard across all variants. On the downside, the small rear windows of the old version remain. On this front, the new Swift does lose out a bit to competition. All said, it remains an extremely exciting car. It is fun on the sharp turns. In terms of speed, it is all right. In any case, small cars in India are geared for economy rather than speed. Prices are expected to be Rs 15,000 to Rs 30,000 higher than the existing variants, which would make the anti-lock braking and the dual front airbag-equipped ZXi model cost around Rs 560,000 to Rs 570,000. Long waiting list: If you order a new Swift now, delivery will be in October at the earliest.